The Zanna collection features ornate wood carved details on the bracket feet, gold leaf patterned trim on drawer fronts and fluting used on pieces throughout the collection that can transform your master bedroom into an elegant space. All pieces feature a brown cherry finish which is accented by the gold in the drawer trim. A focal point of the collection comes from the button tufted headboard which can show off your glamorous side with the faux leather upholstery while also adding additional comfort to your bed. This collection, when brought together, can create a traditional, elegant room to call your own. This dresser and mirror combine a detailed nine drawer dresser and a simple wood framed landscape mirror to make an excellent addition to your master bedroom. Your elegant style is portrayed in details like the gold leaf trim along the drawers and the bracket feet of the dresser. The beveled glass mirror sits in a simple wood frame with a slight arch and curves to the top. 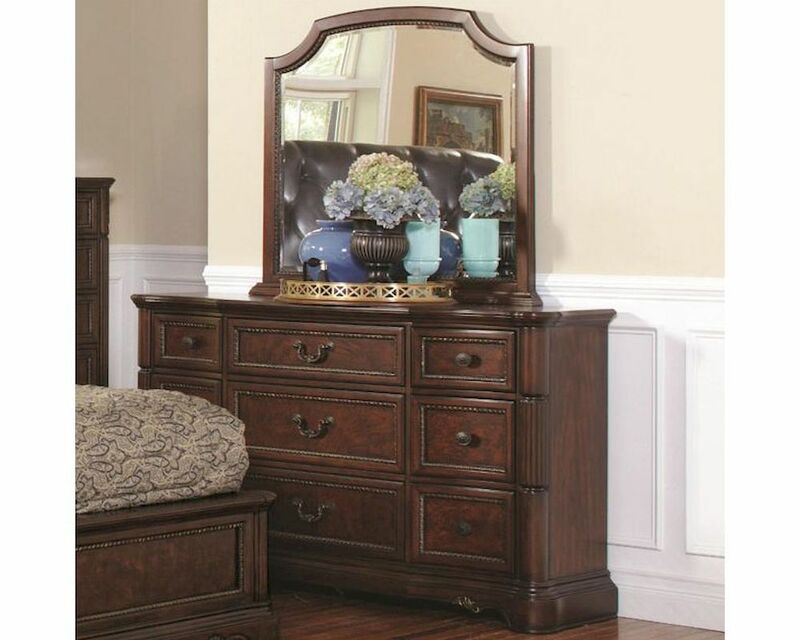 Together these two pieces are joined to effortlessly provide storage and style for your bedroom suite.